The Omniguard Cellular (serial numbers beginning with "C5") includes an internal cell modem that can be used to email notifications and daily logs. This service is free for the first two years. Fill out the form below to register your Omniguard and activate this new feature. This service uses the Verizon network and is only available in the United States. If your Omniguard printed out a "SERVICE INFORMATION" slip, enter the four IMEI characters given. 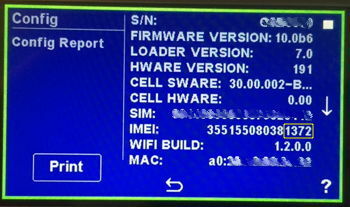 If you do not have a "SERVICE INFORMATION" slip, you will need to view the Configuration Report to get the IMEI. 1. Tap the printer icon on the Home screen. 2. 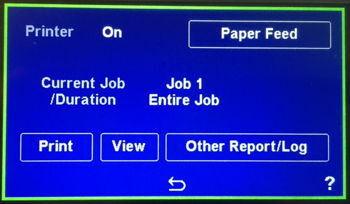 Select "Other Report/Log" on the Printer Settings screen. 3. 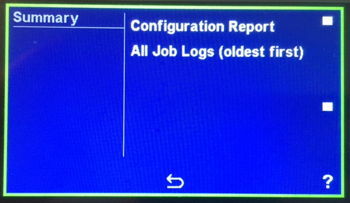 Select "Configuration Report" from the list of reports. 4. Make a note of the last four characters of the IMEI. In this case that would be "1372".